Do you have neck or upper back tension, stiffness or pain related to using your computer, tablet or phone? You may have the modern malady known as ‘Tech Neck’ AKA, ‘Text Neck’ – And here’s why you should probably take that nagging neck pain seriously! Here’s a YouTube video playlist with four videos defining, describing and offering tips and solutions to avoiding or correcting Tech Neck – Doctors, a TV Journalist and a Yoga Teacher all share their views. What Is Tech Neck (Or Text Neck?) And Is There A Difference? 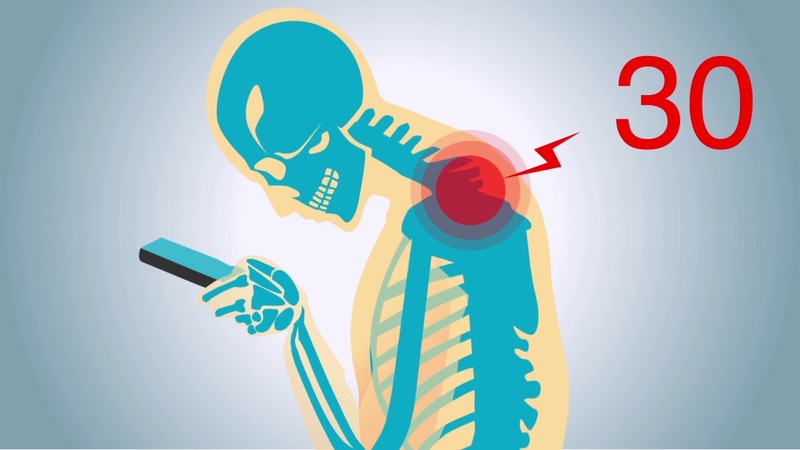 ‘Tech Neck’ seems to be the more general term for tech-related stress, repetitive strain and poor Ergonomics that causes neck and upper back pain. ‘Text Neck’ seems to be more specific to the stress and eventual damage to the cervical spine that can result from looking down and texting too much on ones smartphone or tablet. The term ‘Text Neck’ was coined by Dr. DL Fishman, D.C., a Florida Chiropractor. It applies to emailing on ones phone or tablet, as well as the ubiquitous texting everyone is so fond of – Not to mention gaming! A recent study shows that 79% of the population between the age 18-44 have their cell phones with them almost all the time, with only 2 hour of their walking day spend without their cell on hand. Text neck most commonly causes neck pain and soreness. The essence of the problem is that the human head is very heavy, weighing in at 8-12 pounds for an average adult, which is comparable to a bowling ball. So, just about everyone should probably be at least a little concerned about this modern malady. The most common manifestations of Text Neck are neck pain, soreness and stiffness. Pain and soreness: Usually mostly muscular soreness or pain, which can be specific to one spot or more of a general, dull ache over a larger area of the neck or upper shoulders / upper back. Can become a sharp or stabbing pain in extreme or advanced cases. Headaches: The little muscles at the base of the skull, known as the Sub-Occipitals, can become excessively tight and cause potentially severe tension headaches, partly by restricting the blood flow of the Vertebral Artery, which lies just underneath those muscles. So, What’s The Solution To Text Neck? The first, and obvious answer is to stop looking down at your phone or tablet so much, and to practice better posture / Ergonomics. But the consequences of not breaking the cycle can eventually be devastating. At least vow to stop texting or browsing your social media accounts while walking. It’s just not necessary except in rare instances, right? It’s very difficult to walk, text… watch where you’re going… AND maintain any semblance of proper posture! How about using your device in bed at night? Can you break that one? At least prop your device up on a stack of pillows or cushions if you keep doing that! If you are truly in a lot of pain or have what seems to be stubbornly chronic symptoms, whether mild, moderate OR severe, then please seek some help from a professional. Or you may find that a Physical Therapist or Physiotherapist is just what you need. And, of course, being sure to get enough exercise and to maintain your core and upper body strength is essential. There’s no way around that in the long run!